Factory sealed,unopened exclusive 2 disc set. The quality of directors, actors, location and eeiry suspence add to the ghostly subject. Best performance by Nicole Kidman. Excellent only on the fist time. This movie is a excellent movie when watched the first time. I liked the suspence and thrill of the first time being watched. I baught this off ebay because I thought it was a great movie, but was highly disappointed the second time watching it. Mostly because I already new that they were all dead and the acctual ghosts in the house were alive. The little girl was summon many times to a elderly lady that was a professonal at her job of sommoning ghosts. The mother went crazy and killed the kids and herself prior. The husband/father was sent off to war and the housekeepers were all dead as well. Other then that the movie was a great one! 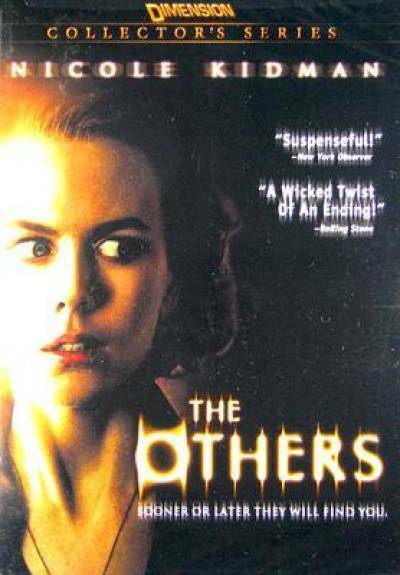 The Others is a superb thriller!! Nicole Kidman and the cast are riveting! I have been a fan of this movie since it was released. It’s absolutely awesome. One of the very few supernatural movies I enjoyed!! I'm normally not a fan of supernatural horror, simply because I need to see the horror/terror/gore to get scared, stairs creaking/ghosts/dark hallways/voices don't normally scare me at all in fact they normally leave me bored and feeling like I've wasted my time. However, this movie surprised me. I won't give any details away about the plot, but from the beginning this movie had me intrigued with the visitors arriving at the door, and it never let up until the twisted ending. I would recommend this simply for the killer ending alone, but the movie as a whole is definitely well done.